The formation of the new Italian government has once more stirred up fear that the euro area might break up. An Italian exit has become a feasible scenario. In the past few months, the eurosceptic government’s plan for increased welfare spending financed by tax cuts has been worrying investors. They increasingly doubt the fiscal sanity of Italy’s new government, and the yields of Italian sovereign bonds with two years of maturity have increased by approximately 2% (Figure 1). Source: Bayer et al. (2018). Direct credit default. Investors may be worried that the Italian government may not be able to completely repay its debt, and will become insolvent. Indirect credit defult. Imagine the following scenario: assume Italy exited the euro area and converted its debt one-to-one with a new currency, the 'new lira' or 'MiniBOT'. This conversion would be necessary to recapitalise the banking sector. The Italian central bank would once again be fully responsible for monetary policy, and so Italy would no longer be subject to the price stability mandate of the euro area. Instead, monetary policy in Italy would probably be driven by two motives: first, the Bank of Italy may want to stimulate the Italian economy in the short run by depreciating the new currency, making the products of Italian companies competitive in the world market; and second, the Bank of Italy may prefer to accept higher inflation in order to devalue the government’s debt. Investors would anticipate these potential events, and the new currency would depreciate relative to the euro directly after it was introduced. Investors would obtain the nominal value of their money, although it would be less valuable than if it were in euros. This financial risk is defined as a 'redenomination risk' and is driven by the expected probability of an exit plus the expected degree of depreciation (or appreciation) of the new currency relative to the old currency. Both factors would increase the additional premium that investors required to compensate for redenomination risk. Therefore, redenomination risk can be estimated using return differences between assets. Other authors have used bonds with five-year residual maturity (Krishnamurthy et al. 2018) or compared premia on different types of credit default swaps (De Santis 2015) to estimate it. In a recent paper (Bayer et al. 2018), we propose a new measure of redenomination risk that relies on the comparison of entire yield curves for two types of bonds: bonds which cannot be redenominated into the new currency, and bonds which can. By estimating the entire yield curve, our measure not only exploits information from a broader bond portfolio, but also identifies the horizon of redenomination expectations. To obtain comparable yield curve estimates, we clean the yields of the two different groups from the risk of a direct credit default. We are able to show that redenomination risk shows up strongly at the short end of the yield curve (one-year yields). Figure 2 shows the yield premium over the first year of Italian sovereign bonds relative to bonds free of redenomination risk. In other words, it shows the compensation for investors for holding an asset for one year that might be redenominated into the new Italian currency. The figure shows that Italy experienced a steep increase in redenomination risk during the European sovereign debt crisis of 2010–2014. 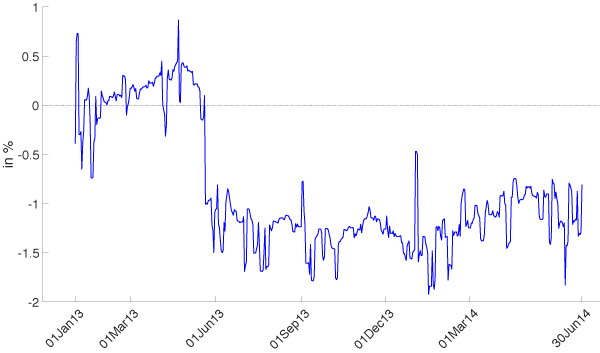 The yield premium peaked at 7%. In other words, markets attached a substantial likelihood to an Italian exit or expected a massive depreciation at that time. In addition, the premium has generally been positive, which shows that the financial markets expected a depreciation of the new currency if Italy exited the euro area. 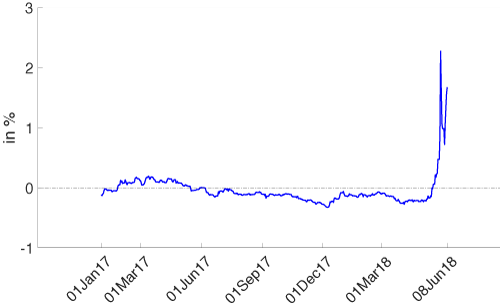 Note: This is the yield premium over the first year for Italian sovereign bonds relative to bonds free of redenomination risk. The ECB was aware of the high breakup expectations in the financial markets at that time, and introduced monetary policy operations to stabilise this risk. At the Global Investment Conference in Londonon 26 July 2012, Mario Draghi stated that the ECB must deal with the “risk of convertibility” and would do “whatever it takes to preserve the euro”. After this now-famous speech, the ECB introduced the Outright Monetary Transaction (OMT) programme. Before the introduction of the OMT, the ECB also introduced two additional monetary policy operations in response to the European sovereign debt crisis: the Long Term Refinancing Operations (LTRO) and the Securities Markets Program (SMP). We examine the effect of ECB monetary policy on redenomination risk and calculated the difference in redenomination risk 20 days before, and 20 days after, its four interventions (SMP1, SMP2, LTRO, and OMT). We use this time window for two reasons. The first is to exclude the possibility that the market participants had anticipated the operations before the introduction of the interventions. Second, we consider 20 days after the introduction of the interventions because their effects might appear later. 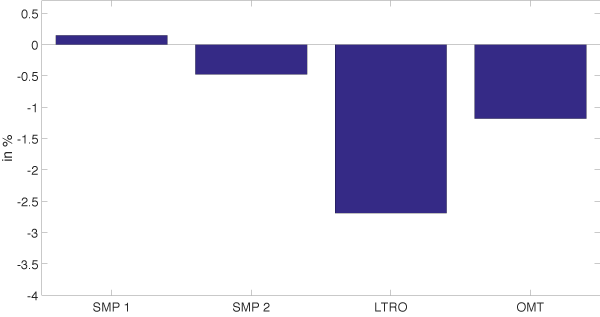 Figure 3 shows that the second phase of the SMP (which had a significantly larger purchase amount than the first phase), the LTRO, and the OMT led to a strong decrease in Italy’s redenomination risk. Redenomination risk is not exclusively a crisis-country phenomenon. We showed that from 2010 to 2014, the yields of short-maturity German bonds with redenomination risk were about 0.75% lower than the bonds without redenomination risk. In other words, the financial markets also considered a German exit from the euro area to be a possibility. However, unlike in Italy, investors expected the new German currency to appreciate against the euro. In addition, the monetary policy operations of the ECB increased the exit expectations about Germany and led to a higher redenomination risk of German bonds. This can be explained by the fact that the ECB operations were strongly criticised by the German side. The criticism peaked in 2012. Members of the German parliament from across the political spectrum (Peter Gauweiler of the CSU, a conservative party, and Gregor Gysi from Die Linke, a socialist, for example) took the ECB to the Federal Constitutional Court. They accused the ECB of exceeding its mandates with the OMT program. During the proceedings before the German Constitutional Court in April and June 2013, Germany’s redenomination risk decreased by 1% and became negative (Figure 4). On 19 April 2013 the German Constitutional Court announced an official two-day hearing, to take place on 11 and 12 June 2013. The agenda, and the invited experts (among others, Hans-Werner Sinn and Harald Uhlig, who had been publicly critical of the ECB programmes), indicated that the judge had a critical perspective of the OMT. On 2 June 2013, the Frankfurter Allgemeine Zeitungpublished an article about a study of a past constitutional judge with a headline that translates as: “If necessary, Germany is obliged to exit the euro". 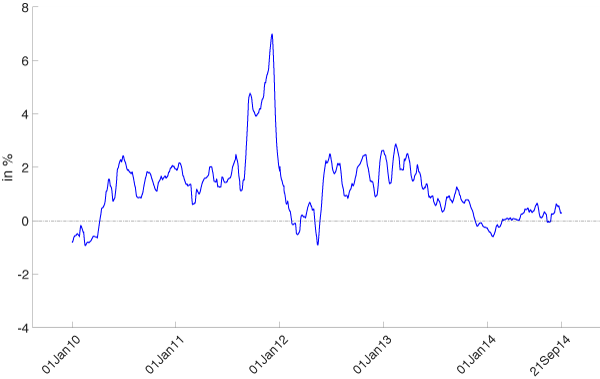 [TIM1] Only after February 2014, when the case was transferred to the European Court of Justice, did the redenomination risk begin to slowly recover. Note: Negative deviations from zero indicate expectation of redenomination followed by an appreciation. Until now, convertibility risk has not been realised in any euro area country. No country has exited the euro area and introduced a new currency. Our results show, however, that the possibilityof a euro area exit already has implications on financial markets, and particularly on short-term interest rates. These affect household assets in particular, and the rate at which households borrow, and implies redistribution between savers and borrowers even though it might not be politically desirable. Bayer, C, C Kim and A Kriwoluzky (2018), "The term structure of redenomination risk ," CEPR Discussion Paper 12965. De Santis, R (2015), "A measure of redenomination risk", ECB working paper 1785. Krishnamurthy, A, S Nagel, and A Vissing-Jorgensen (2018), "ECB policies involving government bond purchases: Impact and channels", Review of Finance 22(1): 1–44.